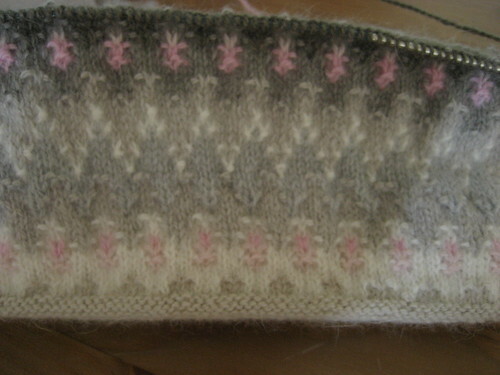 My mother gave me a gorgeous Bohus sweater kit for Christmas way back in 2007. I've been afraid to touch it ever since so I decided to pick up a small hat kit to see if I was ever going to be ready to tackle the "real thing." After about two months in the stash, the draw of knitting in the round on teeny tiny needles was too much to resist. I decided to pull it out and begin working on it. Although this photo is a little out of date, here's what it looks like so far. And here's a mandatory picture of the wrong side. I've managed to make it through 55 of the 65 colour work rows for the body of the hat. 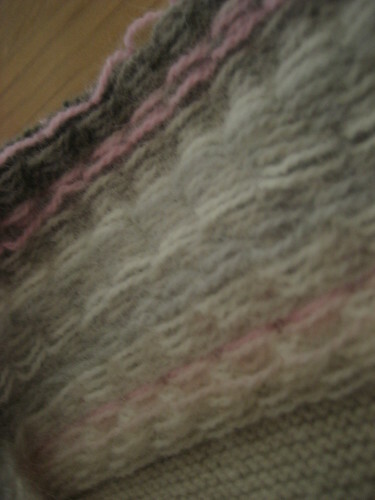 I think that I should be able to finish the knitting later this week. Then all that will be left is about 80 different ends to weave in. The only downside is that I promised myself I wouldn't pick up another knitting project until I make it through some of my other Summer of Craft goals. Therein lies the real challenge. Posted by Amanda at 7:48 p.m.
Lovely stuff! How's the hat progressing now? October 17, 2009 at 10:24 p.m.